Description: AEM's X-Series OBDII Wideband UEGO AFR Sensor Controller Gauge (PN 30-0333) provides tuners who are using piggyback tuning modules or open source software with the ability to view AFR through the factory CAN-bus stream that is output by the factory ECU, and deliver the most accurate, safe and powerful tune. The 30-0333 X-Series OBDII Wideband Gauge is verified to work with HPTuners and DashDaq, with more applications being validated. The X-Series Wideband AFR OBDII Gauge includes an OBDII connector and Bosch 4.9LSU sensor that can be free-air calibrated or used with the factory resistor calibration. Additional wiring for a 0-5v or RS232 Serial output can be added by the user for outputting to a data logger. This OBDII pass-through capability replaces the traditional AEMnet stream available in the 30-0300 X-Series Wideband AFR Gauge Controller. The OBDII output simulates an auxiliary ECU signal when plugged into a vehicle’s OBD port, which requires a unique address from the other ECUs already on a vehicle’s network. AEM’s default OBDII CAN address will work with most popular vehicles and adjustments should not be necessary. However, AEM has provided OBDII address programmability through the buttons on the gauge face if a different address other than the default address is required, allowing users to program ECU #, Parameter Identification (PID), Message Identifier, and Bit Rate. X-Series Widebands are the fastest responding wideband air/fuel ratio controllers in independent testing against 17 other wideband UEGO air/fuel controllers. * The controller’s high speed digital implementation ensures no loss of signal fidelity and full transient response, making it able to identify the slightest fluctuations in AFR and output them in full value. WHY RESPONSE TIME MATTERS Faster response time improves wideband feedback control, and can provide a safer, more powerful and accurate tune. AEM’s Wideband Controllers with X-Digital technology reduce deadtime and can improve the performance of your vehicle through more accurate AFR tuning. FACTORY CALIBRATION RESISTOR OR FREE-AIR CAL, IT’S YOUR CHOICE! X-Series Wideband Gauges and the X-Series Inline Controller support the popular Bosch 4.9LSU sensor, and can utilize both the factory calibration resistor and free-air calibration methods. This allows users to take advantage of the precise factory resistor calibration when a sensor is new but then allows for free-air calibrations if the user desires when the sensor ages. ** It’s the perfect marriage of simplicity and accuracy! WHAT IS A WIDEBAND UEGO AIR/FUEL CONTROLLER? 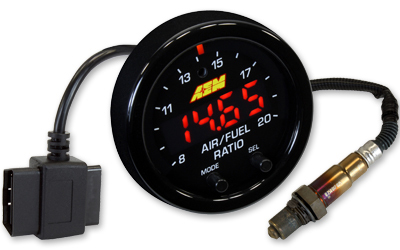 AEM's Wideband UEGO (Universal Exhaust Gas Oxygen, pronounced “You-Way-Go”) Controllers are powerful, cost effective tuning tools that allow users to accurately monitor the Air/Fuel Ratio (AFR) of their engine. * Independently tested at 360° Product Testing (results reported on August 31st, 2015) against 17 competitor wideband UEGO Air/Fuel Controllers. 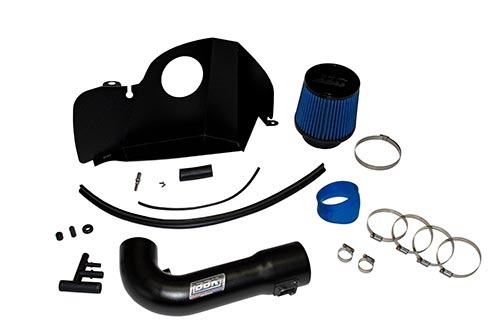 AEM X-Series Inline with Bosch 4.9LSU wideband sensor and AEM X-Series Wideband UEGO AFR Gauge with Bosch 4.9LSU sensor recorded the fastest response times. ** Wideband UEGO sensors are wear items and their lifespan is determined by many factors including contamination from leaded fuels, automotive fluids, particulates, mechanical or thermal shock and from being unheated and exposed to the exhaust stream. Free-air calibration may correct drift as a sensor ages, but it is recommended that they are replaced as part of your vehicle’s maintenance program. When performing free-air calibration, please follow the procedure outlined in the instruction manual.